In summary, while Beard's (1993b) methods were followed as closely as possible, the results of this exercise do not support the Primatomorpha hypothesis. This is true even when bats are removed from the analysis so that the competing Volitantia hypothesis cannot possibly be supported (Analysis 3). When the results of these phylogenetic analyses are considered together with the results of the character analyses conducted by Hamrick et al. (1999), Sargis (2002d), Stafford and Thorington (1998), and Szalay and Lucas (1993, 1996), as well as the phylogenetic analyses of Bloch et al. (2002), Kriz and Hamrick (2001), Shoshani and McKenna (1998), and Silcox (2001a,b, 2002), the Primatomorpha hypothesis must be rejected. Analysis 2 does, however, support Volitantia (Figures 4 and 5), and this hypothesis has been further corroborated by the character analyses of Hamrick et al. (1999), Stafford and Thorington (1998), Szalay and Lucas (1993, 1996), and Thewissen and Babcock (1992), as well as the phylogenetic analyses of Bloch et al. (2002), Kriz and Hamrick (2001), Shoshani and McKenna (1998), and Silcox (2001a,b, 2002). Based on morphological evidence, therefore, it would appear that the sister taxon of Dermoptera is Chiroptera, not Primates (Bloch et al., 2002; Johnson and Kirsch, 1993; Kriz and Hamrick, 2001; Novacek, 1982, 1986, 1989, 1990, 1992, 1993, 1994; Novacek and Wyss, 1986; Novacek et al., 1988; Sargis, 2002d; Shoshani and McKenna, 1998; Silcox, 2001a,b, 2002; Simmons, 1995; Simmons and Quinn, 1994; Szalay, 1977; Szalay and Lucas, 1993, 1996; Thewissen and Babcock, 1991, 1992, 1993; Wible, 1993; Wible and Covert, 1987; Wible and Novacek, 1988; contra Beard, 1989, 1993a,b; McKenna and Bell, 1997). Again, it seems that Primatomorpha represents an unnatural grouping (see previous section; Sargis, 2002d). If Volitantia is better supported by morphological studies than Primatomorpha, then what is the sister taxon to Volitantia? Shoshani and McKenna's (1998) analysis supported a Volitantia-Euprimates clade, but Analysis 2 of this study supported a Volitantia-Scandentia clade (Figures 4 and 5). The latter clade has also been supported by the analyses of Silcox (2001a,b, 2002) and Bloch et al. (2002). The most significant problem with the morphological support of Volitantia is that molecular studies have continually rejected this clade (Adkins and Honeycutt, 1991, 1993; Allard et al., 1996; Cronin and Sarich, 1980; Honeycutt and Adkins, 1993; Liu and Miyamoto, 1999; Liu et al., 2001; Murphy et al., 2001a,b; Porter et al., 1996; Waddell et al., 1999). It is, of course, possible that dermopterans and chiropterans evolved their similarities independently (see above), so Volitantia may represent an unnatural grouping based on convergent, rather than homologous, characters (Sargis, 2002d). While a Scandentia-Euprimates clade has been supported by cranial evidence (Kay et al., 1992; Wible and Covert, 1987; Wible and Novacek, 1988), such a clade is not supported by this analysis of postcranial data. Alternatively, molecular evidence has repeatedly supported a Scandentia-Dermoptera clade (Liu and Miyamoto, 1999; Liu et al., 2001; Madsen et al., 2001; Murphy et al., 2001a,b) with Primates as the sister taxon to this clade (Figure 1D; Liu and Miyamoto, 1999; Liu et al., 2001; Murphy et al., 2001a,b). A Scandentia-Dermoptera clade is also supported by postcranial evidence when Chiroptera is removed from the analysis (Analysis 3; Figure 6). This clade is supported by craniodental evidence as well, but only when Chiroptera is removed from the phylogenetic analysis (Bloch et al., 2002; Silcox, personal communication). The most probable sister taxon of Dermoptera, therefore, may be Scandentia rather than either Primates or Chiroptera. The relationship of plesiadapiforms to Euprimates could not be fully assessed here because of missing data in fossil plesiadapiforms, as well as the fact that only postcranial data were analyzed. In recent studies that included craniodental evidence, however, a Plesiadapiformes-Euprimates clade (i.e., Primates, sensu lato) was supported (Bloch et al., 2002; Silcox, 2001a,b, 2002). Plesiadapiforms should, therefore, be included in Primates rather than Dermoptera (Bloch et al., 2002; Silcox, 2001a,b, 2002). Finally, the inclusion of Ptilocercus in these analyses had significant effects on the results. For instance, when Ptilocercus is used to represent Scandentia in Beard's (1993b) analysis (Analysis 1), the molecular concept of Euarchonta is supported (Figure 3; Table 4), whereas this clade was not supported when Beard (1993b) used Tupaia to represent Scandentia (Figure 2). The inclusion of Ptilocercus also resulted in the identification of morphological synapomor-phies for a Dermoptera-Scandentia clade (Table 4), a grouping previously supported only by molecular evidence. 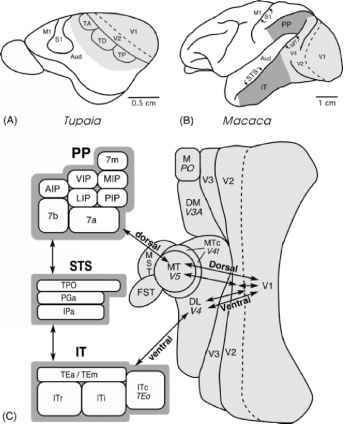 Hence, in studies of primate supraordinal relationships that include comparisons of postcranial characters to those in tupaiids, Ptilocercus should certainly be included in the analysis (Sargis, 2000, 2002a,b,d). Similarly, if tupaiids are chosen as an outgroup in primate phylogenetic analyses that include postcranial evidence, then Ptilocercus should be used as the outgroup because its attributes are more conservative for Scandentia (Sargis, 2000, 2002a,b,d).